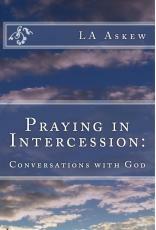 Praying In Intercession: Conversations with God encourages open, honest communication with our Father through prayer. With the restless state of the world today, God and prayer are needed to restore peace. This book walks the reader through different aspects of conversing with God, without the intimidation of formality. Our Father truly loves us, and just wants to talk with us each day.